Liczba stron: 212 Jest to ujednolicona liczba stron, która ułatwi Ci porównanie długości książek. Każda strona Legimi to 200 słów. It's no use; no use at all. The children won't let me stop telling tales of the Land of Oz. I know lots of other stories, and I hope to tell them, some time or another; but just now my loving tyrants won't allow me. They cry: "Oz—Oz! More about Oz, Mr. Baum!" and what can I do but obey their commands?This is Our Book—mine and the children's. For they have flooded me with thousands of suggestions in regard to it, and I have honestly tried to adopt as many of these suggestions as could be fitted into one story. Figure 1 PICKING THE PRINCESS. I believe, my dears, that I am the proudest story-teller that ever lived. Many a time tears of pride and joy have stood in my eyes while I read the tender, loving, appealing letters that come to me in almost every mail from my little readers. To have pleased you, to have interested you, to have won your friendship, and perhaps your love, through my stories, is to my mind as great an achievement as to become President of the United States. Indeed, I would much rather be your story-teller, under these conditions, than to be the President. So you have helped me to fulfill my life's ambition, and I am more grateful to you, my dears, than I can express in words. The shed at Hugson's Siding was bare save for an old wooden bench, and did not look very inviting. As she peered through the soft gray light not a house of any sort was visible near the station, nor was any person in sight; but after a while the child discovered a horse and buggy standing near a group of trees a short distance away. She walked toward it and found the horse tied to a tree and standing motionless, with its head hanging down almost to the ground. It was a big horse, tall and bony, with long legs and large knees and feet. She could count his ribs easily where they showed through the skin of his body, and his head was long and seemed altogether too big for him, as if it did not fit. His tail was short and scraggly, and his harness had been broken in many places and fastened together again with cords and bits of wire. The buggy seemed almost new, for it had a shiny top and side curtains. Getting around in front, so that she could look inside, the girl saw a boy curled up on the seat, fast asleep. "Yes," she answered, looking gravely at his tousled hair and blinking gray eyes. "Have you come to take me to Hugson's Ranch?" "Of course," he answered. "Train in?" "I couldn't be here if it wasn't," she said. He laughed at that, and his laugh was merry and frank. Jumping out of the buggy he put Dorothy's suit-case under the seat and her bird-cage on the floor in front. "Oh, no; it's just Eureka, my kitten. I thought that was the best way to carry her." "Eureka's a funny name for a cat," he remarked. "I named my kitten that because I found it," she explained. "Uncle Henry says 'Eureka' means 'I have found it.'" She climbed into the buggy and he followed her. Then the boy picked up the reins, shook them, and said "Gid-dap!" "Perhaps," said Dorothy, "if you untied him, he would go." "Guess I'm half asleep yet," he said, untying the horse. "But Jim knows his business all right—don't you, Jim?" patting the long nose of the animal. "Thought that train would never come," observed the boy. "I've waited at that station for five hours." "We had a lot of earthquakes," said Dorothy. "Didn't you feel the ground shake?" "Yes; but we're used to such things in California," he replied. "They don't scare us much." Figure 2 DOROTHY POKED THE BOY WITH HER PARASOL. "The conductor said it was the worst quake he ever knew." "Did he? Then it must have happened while I was asleep," he said, thoughtfully. "How is Uncle Henry?" she enquired, after a pause during which the horse continued to trot with long, regular strides. "He's pretty well. He and Uncle Hugson have been having a fine visit." "Is Mr. Hugson your uncle?" she asked. "Yes. Uncle Bill Hugson married your Uncle Henry's wife's sister; so we must be second cousins," said the boy, in an amused tone. "I work for Uncle Bill on his ranch, and he pays me six dollars a month and my board." "Isn't that a great deal?" she asked, doubtfully. "Why, it's a great deal for Uncle Hugson, but not for me. I'm a splendid worker. I work as well as I sleep," he added, with a laugh. "What is your name?" asked Dorothy, thinking she liked the boy's manner and the cheery tone of his voice. "Not a very pretty one," he answered, as if a little ashamed. "My whole name is Zebediah; but folks just call me 'Zeb.' You've been to Australia, haven't you?" "Yes; with Uncle Henry," she answered. "We got to San Francisco a week ago, and Uncle Henry went right on to Hugson's Ranch for a visit while I stayed a few days in the city with some friends we had met." "Only a day. Tomorrow Uncle Henry and I must start back for Kansas. We've been away for a long time, you know, and so we're anxious to get home again." The boy flicked the big, boney horse with his whip and looked thoughtful. Then he started to say something to his little companion, but before he could speak the buggy began to sway dangerously from side to side and the earth seemed to rise up before them. Next minute there was a roar and a sharp crash, and at her side Dorothy saw the ground open in a wide crack and then come together again. "Goodness!" she cried, grasping the iron rail of the seat. "What was that?" "That was an awful big quake," replied Zeb, with a white face. "It almost got us that time, Dorothy." The horse had stopped short, and stood firm as a rock. Zeb shook the reins and urged him to go, but Jim was stubborn. Then the boy cracked his whip and touched the animal's flanks with it, and after a low moan of protest Jim stepped slowly along the road. Neither the boy nor the girl spoke again for some minutes. There was a breath of danger in the very air, and every few moments the earth would shake violently. Jim's ears were standing erect upon his head and every muscle of his big body was tense as he trotted toward home. He was not going very fast, but on his flanks specks of foam began to appear and at times he would tremble like a leaf. Suddenly there was a rending, tearing sound, and the earth split into another great crack just beneath the spot where the horse was standing. With a wild neigh of terror the animal fell bodily into the pit, drawing the buggy and its occupants after him. Dorothy grabbed fast hold of the buggy top and the boy did the same. The sudden rush into space confused them so that they could not think. Blackness engulfed them on every side, and in breathless silence they waited for the fall to end and crush them against jagged rocks or for the earth to close in on them again and bury them forever in its dreadful depths. The horrible sensation of falling, the darkness and the terrifying noises, proved more than Dorothy could endure and for a few moments the little girl lost consciousness. Zeb, being a boy, did not faint, but he was badly frightened, and clung to the buggy seat with a tight grip, expecting every moment would be his last. HEN Dorothy recovered her senses they were still falling, but not so fast. The top of the buggy caught the air like a parachute or an umbrella filled with wind, and held them back so that they floated downward with a gentle motion that was not so very disagreeable to bear. The worst thing was their terror of reaching the bottom of this great crack in the earth, and the natural fear that sudden death was about to overtake them at any moment. Crash after crash echoed far above their heads, as the earth came together where it had split, and stones and chunks of clay rattled around them on every side. These they could not see, but they could feel them pelting the buggy top, and Jim screamed almost like a human being when a stone overtook him and struck his boney body. They did not really hurt the poor horse, because everything was falling together; only the stones and rubbish fell faster than the horse and buggy, which were held back by the pressure of the air, so that the terrified animal was actually more frightened than he was injured. How long this state of things continued Dorothy could not even guess, she was so greatly bewildered. But bye and bye, as she stared ahead into the black chasm with a beating heart, she began to dimly see the form of the horse Jim—his head up in the air, his ears erect and his long legs sprawling in every direction as he tumbled through space. Also, turning her head, she found that she could see the boy beside her, who had until now remained as still and silent as she herself. With this thought in mind the girl took heart and leaned her head over the side of the buggy to see where the strange light was coming from. Far below her she found six great glowing balls suspended in the air. The central and largest one was white, and reminded her of the sun. Around it were arranged, like the five points of a star, the other five brilliant balls; one being rose colored, one violet, one yellow, one blue and one orange. This splendid group of colored suns sent rays darting in every direction, and as the horse and buggy—with Dorothy and Zeb—sank steadily downward and came nearer to the lights, the rays began to take on all the delicate tintings of a rainbow, growing more and more distinct every moment until all the space was brilliantly illuminated. "Isn't it funny?" she said. The boy was startled and his eyes were big. Dorothy had a green streak through the center of her face where the blue and yellow lights came together, and her appearance seemed to add to his fright. "I—I don't s-s-see any-thing funny—'bout it!" he stammered. Figure 3 HORSE, BUGGY AND ALL FELL SLOWLY. 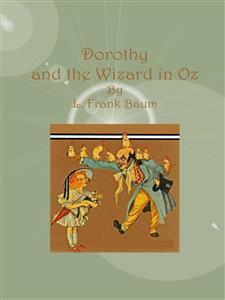 Dorothy and Zeb looked at one another in wonder. "Can your horse talk?" she asked. "Never knew him to, before," replied the boy. "Those were the first words I ever said," called out the horse, who had overheard them, "and I can't explain why I happened to speak then. This is a nice scrape you've got me into, isn't it?" "As for that, we are in the same scrape ourselves," answered Dorothy, cheerfully. "But never mind; something will happen pretty soon." "Of course," growled the horse; "and then we shall be sorry it happened." Zeb gave a shiver. All this was so terrible and unreal that he could not understand it at all, and so had good reason to be afraid. Swiftly they drew near to the flaming colored suns, and passed close beside them. The light was then so bright that it dazzled their eyes, and they covered their faces with their hands to escape being blinded. There was no heat in the colored suns, however, and after they had passed below them the top of the buggy shut out many of the piercing rays so that the boy and girl could open their eyes again. "We've got to come to the bottom some time," remarked Zeb, with a deep sigh. "We can't keep falling forever, you know." "Of course not," said Dorothy. "We are somewhere in the middle of the earth, and the chances are we'll reach the other side of it before long. But it's a big hollow, isn't it?" At this they both put their heads over the side of the buggy and looked down. Yes; there was land below them; and not so very far away, either. But they were floating very, very slowly—so slowly that it could no longer be called a fall—and the children had ample time to take heart and look about them. They saw a landscape with mountains and plains, lakes and rivers, very like those upon the earth's surface; but all the scene was splendidly colored by the variegated lights from the six suns. Here and there were groups of houses that seemed made of clear glass, because they sparkled so brightly. "I'm sure we are in no danger," said Dorothy, in a sober voice. "We are falling so slowly that we can't be dashed to pieces when we land, and this country that we are coming to seems quite pretty." "We'll never get home again, though!" declared Zeb, with a groan. "Oh, I'm not so sure of that," replied the girl. "But don't let us worry over such things, Zeb; we can't help ourselves just now, you know, and I've always been told it's foolish to borrow trouble." The boy became silent, having no reply to so sensible a speech, and soon both were fully occupied in staring at the strange scenes spread out below them. They seemed to be falling right into the middle of a big city which had many tall buildings with glass domes and sharp-pointed spires. These spires were like great spear-points, and if they tumbled upon one of them they were likely to suffer serious injury. Jim the horse had seen these spires, also, and his ears stood straight up with fear, while Dorothy and Zeb held their breaths in suspense. But no; they floated gently down upon a broad, flat roof, and came to a stop at last. When Jim felt something firm under his feet the poor beast's legs trembled so much that he could hardly stand; but Zeb at once leaped out of the buggy to the roof, and he was so awkward and hasty that he kicked over Dorothy's birdcage, which rolled out upon the roof so that the bottom came off. At once a pink kitten crept out of the upset cage, sat down upon the glass roof, and yawned and blinked its round eyes. "Oh," said Dorothy. "There's Eureka." "First time I ever saw a pink cat," said Zeb. "Eureka isn't pink; she's white. It's this queer light that gives her that color." "Where's my milk?" asked the kitten, looking up into Dorothy's face. "I'm 'most starved to death." "Oh, Eureka! Can you talk?" "Talk! Am I talking? Good gracious, I believe I am. Isn't it funny?" asked the kitten. "It's all wrong," said Zeb, gravely. "Animals ought not to talk. But even old Jim has been saying things since we had our accident." "I can't see that it's wrong," remarked Jim, in his gruff tones. "At least, it isn't as wrong as some other things. What's going to become of us now?" The houses of the city were all made of glass, so clear and transparent that one could look through the walls as easily as though a window. Dorothy saw, underneath the roof on which she stood, several rooms used for rest chambers, and even thought she could make out a number of queer forms huddled into the corners of these rooms. The roof beside them had a great hole smashed through it, and pieces of glass were lying scattered in every direction. A near by steeple had been broken off short and the fragments lay heaped beside it. Other buildings were cracked in places or had corners chipped off from them; but they must have been very beautiful before these accidents had happened to mar their perfection. The rainbow tints from the colored suns fell upon the glass city softly and gave to the buildings many delicate, shifting hues which were very pretty to see. But not a sound had broken the stillness since the strangers had arrived, except that of their own voices. They began to wonder if there were no people to inhabit this magnificent city of the inner world. Suddenly a man appeared through a hole in the roof next to the one they were on and stepped into plain view. He was not a very large man, but was well formed and had a beautiful face—calm and serene as the face of a fine portrait. His clothing fitted his form snugly and was gorgeously colored in brilliant shades of green, which varied as the sunbeams touched them but was not wholly influenced by the solar rays. The man had taken a step or two across the glass roof before he noticed the presence of the strangers; but then he stopped abruptly. There was no expression of either fear or surprise upon his tranquil face, yet he must have been both astonished and afraid; for after his eyes had rested upon the ungainly form of the horse for a moment he walked rapidly to the furthest edge of the roof, his head turned back over his shoulder to gaze at the strange animal. But he paid no attention to her warning. He reached the edge of the tall roof, stepped one foot out into the air, and walked into space as calmly as if he were on firm ground. The girl, greatly astonished, ran to lean over the edge of the roof, and saw the man walking rapidly through the air toward the ground. Soon he reached the street and disappeared through a glass doorway into one of the glass buildings. "How strange!" she exclaimed, drawing a long breath. "Come back, Eureka!" she called, in distress, "you'll certainly be killed." "I have nine lives," said the kitten, purring softly as it walked around in a circle and then came back to the roof; "but I can't lose even one of them by falling in this country, because I really couldn't manage to fall if I wanted to." "Does the air bear up your weight?" asked the girl. "Suppose we let Eureka go down to the street and get some one to help us," suggested Zeb, who had been even more amazed than Dorothy at these strange happenings. "Perhaps we can walk on the air ourselves," replied the girl.